Would like to contribute to the Aitoc blog? Please read the guidelines below to make sure your post meets our criteria. Your post must pertain to eCommerce and/or Magento. We prefer Magento-related posts to wider-interest eCommerce posts. You must have at least 3 guest posts published on third-party (not your own!) industry resources. “Industry” is the keyword here, because, if you blog about everything from mobile apps, to online games, to dog food, it’s unlikely that your post will be approved. You must be an expert in your topic. 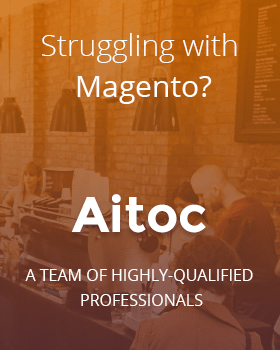 We give priority to expert-level contributions by authors who have a great deal of experience and can be regarded as thought leaders in Magento and/or eCommerce. You must be a real person! If we are unable to verify your name, company and/or position from LinkedIn, Google Plus or elsewhere, you post may be rejected. Your post must be in good English (we realize not everyone is a native speaker, but still…), and contain minimum to no grammar or spelling mistakes. A simple spell check is an absolute must! A post that is too general, run-of-the-mill or doesn’t say anything new. You toot your horn and blatantly advertise your product/service in the post. Your post contains unsupported data, presumptions, biased or ill-informed opinion. Your post is a copy of somebody else’s post, a Wikipedia article or your own post published on another resource. We love case studies! For instance, a post “How I built a multi-billion Magento store with 100 dollars” would instantly win our heart. We also like posts that have great headlines. A great headline can make or break your article. Here’s a quick guide on how to write headlines that rock. Informative interviews with people who are considered experts in our industry. Exhaustive, through-out, ultimate guides on a topic. Expert-level posts on hot, burning, recent trends. All in all, if you believe your post is cutting-edge, bring it on! All outgoing links in a guest post will contain a rel=”nofollow” attribute. We don’t want to be penalized for selling guest post links. We do not allow links to your own property (mentions are OK) within the body of your post, unless justified. Such links belong to your byline. A guest post is a great way to showcase your expertise, to reach a wider scope of readers and to build new business relationships – not a quick SEO tactic or a cheap PR move! If you are interested in contributing to our blog, please email to alesia.krush@aitoc.com.